Theory of Blackjack is a book written by Peter Griffin. It is considered as one of the classics in blackjack literature through the years. The book doesn’t serve as an introduction into the famous card game, but is best read by those who already know the basics of the game. It also does not introduce card counting strategies, it would be highly interesting for those who already have a basic understanding of the card counting techniques. The book speaks in great detail about how and why card counting works perfectly for blackjack. It tells how the different systems were derived. It also compares the different card counting systems to see which ones are efficient and which of them you should forget. It also teaches players on how they can calculate the different probabilities in playing the game. This will tell them how to determine the values or what returns to expect from various hands. These are important for optimal blackjack play. Theory of Blackjack is for those who are already into playing the card game. They may be players who are already comfortable in playing at casinos and plan to increase their skill and knowledge in playing the game to do better or probably to increase winnings. They may also be players who already know the challenges behind card counting and are able to realize its importance. The book features mathematical formulations that prove of its being scientific, but there is a lot of other valuable information that makes it comprehensive and useful. Readers can choose not to follow mathematical formulations if they are not well-versed in math, but guarantee success once they are followed. After reading the book, readers can come up with their own card counting system to use that works the best for them. They can also be able to calculate values and expected hands, which is very practical for both hobbyists and professionals. The book is for any level of player as it can serve as a manual for them. Griffin introduced two important factors involved in card counting. These are playing efficiency and betting correlation. He believes these two can accurately estimate win rate for any system in blackjack. 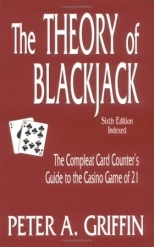 It is one of the many famous books in blackjack, including Edward Thorp’s Beat the Dealer and Stanford Wong’s Professional Blackjack. The book is considered to be a well-written one from a credible author, who is also a university professor. Peter Griffin is a member of the Blackjack Hall of Fame. He studied at Portland State University and obtained Master’s Degree from University of California. From 1965 till his death in 1998, he taught calculus, statistics and equations in California State University. It was 1970 when he first encountered the game blackjack. He went to Nevada to research because he had proposed introducing a course on the mathematical aspect of gambling. His trip enticed him to focus on blackjack. He is also a skillful player who chose to play incognito at several Nevada casinos.